Avoid high density foods: Any food that are high in calories promote elevated leptin. High density foods have a very high ratio of calories and energy to their total volume. Processed food, fried food, cheesecake, ice-cream, pizza, candies and concentrated sugar drinks all fall in this category. Eliminate sugars and grains from you diet: Refined sugar is more addicting than cocaine is; it is one of the most addictive substances you can consume. However it is not the only thing you must avoid when craving sweets. Starch in the form of grains metabolizes into sugar in your body and should also be eliminated from your diet if you suffer from excess weight, diabetes or high cholesterol. Eat plenty of good fats: A diet high in sugar content combined with low essential fat intake causes hunger. Good fat intake combines with quality protein along with heavy fibrous carbs for volume tends to make you full and satisfied so you stop eating. Good fats to include in your diet are: Flaxseed/meal/oil/hempseed/oil, walnuts, pumpkin seed, Brazil nuts, sesame seeds, avocados, dark leafy green vegetables (kale, spinach, chard, mustard greens, and collards), wheat germ oil, salmon, mackerel, sardines, anchovies, albacore tuna, coconut milk and oil, butter and animal fats from free ranging animals. For optimal healthy most people require upwards of 50-70 percent fats in their diet. Avoid chronic hunger by eating more small balanced meals: Hunger needs to be dealt with through food and not drugs and certainly not the current trend introduced by the drug manufacturers to take a pill to curb appetite. Diet pills are very short term measures and will never get you a slim, toned body. 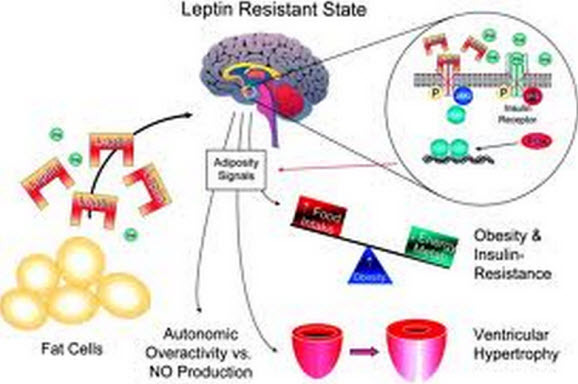 Lose weight: Being overweight goes hand in hand with elevated leptin levels. You have to lose the weight to really get control of this. It’s important to replace the grains, sugars and processed food that you have eliminated with 4-6 whole food, small healthy (no processed foods) balanced meals each with a portion of quality protein and the balance vegetables. Leptin along with insulin is one of the core factors in obesity…which in turn is a factor for cancer and may boost tumor growth. The answer lies in healthy eating and proper exercise to reverse insulin and leptin resistance…not in some pill. Studies have shown that regular, on-going exercise is absolutely crucial in getting rid of dangerous visceral fat and staying rid of it along with normalizing your insulin and leptin levels. The quicker you start on a healthy eating plan and exercise program the sooner you will return your body to a healthy chemical balance that will allow your body to lose that weight, reduce health risks and restore your good health. Proper exercise is one of the most effective ways to regain insulin sensitivity and reverse insulin resistance-this is true for both strength training and high-intensity aerobic (short burst intervals) workouts. 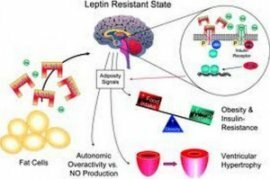 For more life saving information about the role leptin resistance, diet and exercise play in the role of cancer protection and what you can do to avoid cancer; “Just Say No To Cancer” my comprehensive new Cancer prevention program.